This step-by-step guide was composed using 72(including coverpage) high-resolution pictures. In this document, it also listed out the tools and materials used to achieve this composition. The tutorial will walk you through the entire process of creating this FriendshipBand Bracelet. 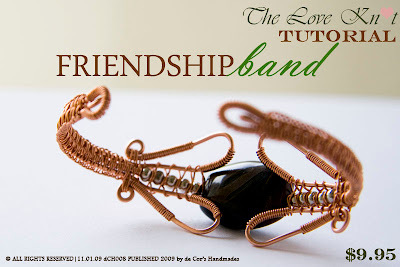 You can also pay for the tutorial via PayPal by sending 9.95USD to decors.l@gmail.com by specifying "DCH008 FriendshipBand Bracelet" in the title of the transaction, or click on the Add to Cart button to purchase. The PDF file will be sent to the e-mail address set in your PayPal profile. PLEASE DO NOT LEND TO OTHERS, SHARE AMONG FORUM, SHARE AMONG FRIENDS, COPY AND MASS PRODUCE THE BRACELET OUT OF IT. And if you would be so kind, please give a credit to me if my tutorial inspired you or helped you in your jewelry making journey, it would be greatly appreciated! Congrats! I hope this does well. It's a beautiful design!